BERLIN, Germany, June 1, 2105 (ENS) – Fifty hydrogen filling stations will be open in Germany’s cities and along major roads by the end of this year, says Dorothee Bär, parliamentary state secretary at the German Federal Ministry of Transport and Digital Infrastructure. 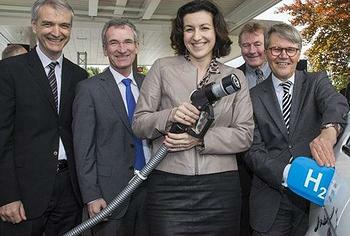 On the way to that goal, Germany’s first hydrogen filling station on the autobahn was officially inaugurated May 4. The new H2 filling pump is located at the TOTAL motorway service area in Geiselwind on the A3 between Würzburg and Nuremberg. It links the existing hydrogen filling facilities in the metropolitan regions of Frankfurt/Main, Stuttgart and Munich, forming a hub for electric hydrogen fuel cell vehicles in southern Germany that will soon link with other H2 filling stations across Europe. The new H2 filling pump is a project of the Clean Energy Partnership formed by German multinational automaker Daimler, gases and engineering company Linde, and the French multinational integrated oil and gas company TOTAL. Unlike the internal combustion engine, which converts heat into motion, the fuel cell transforms the fuel hydrogen directly into electricity that powers an electric motor. Electric vehicles powered by hydrogen fuel cells produce no harmful emissions. They have a long range and can refuel in minutes. Daimler, Ford, Renault and Nissan are jointly developing a common fuel cell system to launch mass-market fuel cell electric vehicles as early as 2017. “Networking the national H2 infrastructure is the key to success for the market introduction of electric vehicles with fuel cells. Only then can they be a ‘real’ alternative for customers,” said Prof. Dr. Herbert Kohler, vice president group research and sustainability and chief environmental officer at Daimler AG. “That’s why we are not only actively investing in the development of the next generation of vehicles, but we are the only car manufacturer to invest in the development of a nationwide network of filling stations in Germany,” Kohler said. The Geiselwind site is part of the expansion plan launched in 2012 that will initially expand the German H2 network from its current 18 locations to 50. With 50 hydrogen filling stations, nationwide mobility between metropolitan areas along the main roads will be possible throughout Germany. “The operators of motorway service areas are committed to the development of new forms of mobility, and have already opened up their facilities for various electric charging concepts. So it is only logical that the first autobahn hydrogen filling station is at a service area,” said Alexander Ruscheinsky, who chairs the Vereinigung Deutscher Autohöfe e.V. (German Association of Motorway Service Areas), at the Geiselwind inauguration. Including Geiselwind, TOTAL operates seven of the 18 existing public H2 filling stations in Germany. TOTAL has invested more than 250,000 euros in Geiselwind and shouldered all construction and approval costs, as well as the project management for installing the hydrogen technology, and service and maintenance of the filling station. Within the overall expansion program, the Daimler-Linde initiative is participating in 20 new H2 stations with a total investment of about 20 million euros. 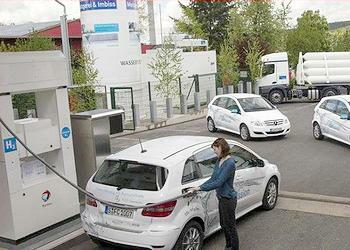 Linde also is expanding the network of public hydrogen fueling stations elsewhere in Europe. On May 21, the Linde Group joined the integrated, international oil and gas company OMV to open a new hydrogen fueling station in Innsbruck, Austria. The Innsbruck H2 station, with the capacity to fuel six vehicles per hour, is located on one of Europe’s key transit routes. It will make the journey from Germany to Italy possible for fuel cell vehicles. Hydrogen is the first choice of future fuel technologies for OMV Manager Alois Wach. Austria’s second public hydrogen fueling station bridges the existing H2 hubs in Munich and Bolzano. It was built as part of the EU-funded HyFIVE (Hydrogen for Innovative Vehicles) project. The HyFIVE project aims to equip cities across Europe – London, Copenhagen, Stuttgart, Munich, Innsbruck and Bolzano – for the upcoming commercialization of fuel cell vehicles. In Vienna, OMV has been operating Austria’s first public hydrogen fueling station since 2012. More stations are planned for Linz, Munich, Nuremberg and Stuttgart in partnership with Linde. To date, Linde has set up 90 hydrogen filling stations in 15 countries and has successfully completed over one million refueling operations.